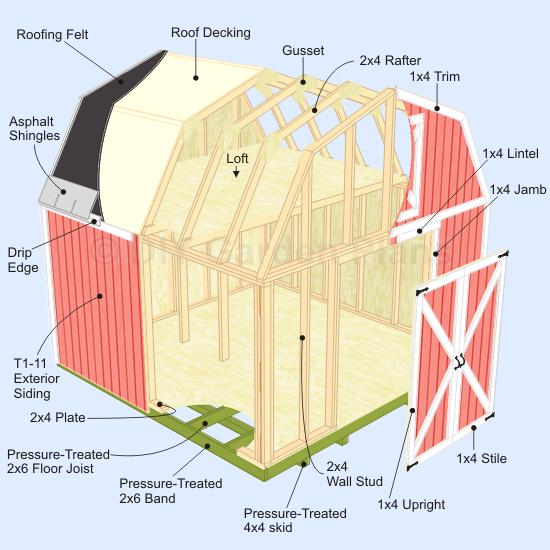 Gambrel shed plans, as its name specifies, distinguishes itself from all other shed plans by specifying the construction of the gambrel type of roof. The gambrel is the unique roof design often associated with the Dutch, but was also commonly used by the English in their Georgian homes. Their gambrel sheds were usually made for the dairy businesses in the early 20th century. per slope is set at a shallow angle, while the lower is designed with a steep position. The main reason given for this design is for the upper level of the structure to have more headroom and more storage space. If you’ll follow the Dutch design on gambrel shed plans, the difference between the upper and lower slopes of the roof is very visible. Most Dutch gambrel roofs have their upper pitch at 20 degrees and their lower pitch at 60 degrees. A variation of the Dutch design features the flaring eaves – the edges of the lower slope curved upwards, instead of just having them straight. They were originally planned to help protect the walls of the shed from rain and snow. These days, the flaring eaves are added generally for style. An English gambrel roof, meanwhile, has upper and lower slopes without much obvious difference. The upper pitch is set at about 25 degrees, while the lower, not more than 45 degrees. Many shed builders like the gambrel style, because it is quite simple to construct, while having a style that’s more interesting than a plain gable design. The gambrel roof traditionally uses only two rafter systems joined in the middle, but today’s materials and procedures let you use gusset joints to make the construction even easier and the roof even sturdier. But gambrel shed plans should also provide you with other distinctive features, aside from the roof shape and slope measurements. You can design your gambrel shed with more windows if you need more air to come through the interior. Big sliding doors would be great if you’ll make the shed your workshop or storage area for large equipment or vehicles. Make the gambrel shed really serve whatever purpose you built it for. Anyway, the gambrel sheds of old were built for function, more than design.